· April 24th, 2014 (10am to 4pm) - Polk Center Earth Day! Visit some of our educational wildlife and many other great environmental displays to help the earth! · April 26th, 2014 (Noon to 4pm) - Annual Wildlife Baby Shower! Visit our center to see some of the wildlife! 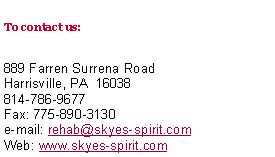 Get the flyer here: www.skyes-spirit.com/2014shower.pdf It’s a fun family day! Schedule of Events - please contact us as soon as possible to schedule your program or event as dates fill quickly. Dates that are shown here are public events, we don’t post school and private events here. E-mail or call to schedule or for more information on events listed below. Check back, this list changes. Copyright © 1998-2013 No unauthorized use of any content on these pages without the consent of Maryjane Angelo or Skye’s Spirit Wildlife Rehabilitation Center.